I did it, guys! My holy grail, my unicorn of baking, has been captured. I finally managed to make a near-perfect macaron (over 20 of them actually)! 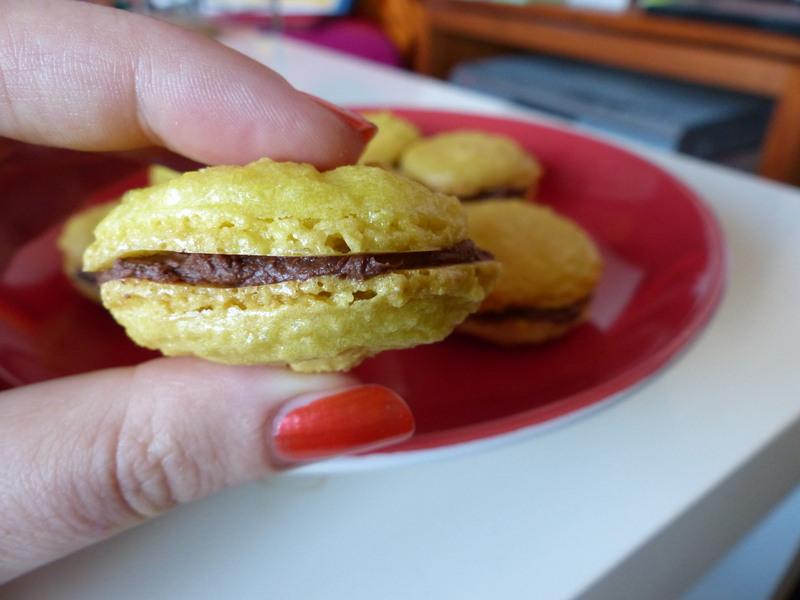 After five attempts (divided over about as many years) that ended in differing degrees of failure, I can finally say that I have baked a successful macaron – and could probably do so again, meaning it wasn’t a fluke. Who knew I had it in me? I certainly thought it was a lost cause. That sounds rather dramatic, doesn’t it? Well, that’s because I’m feeling rather dramatic about this whole macaron making business. Anyway. I finally tried making them again. And they still didn’t turn out right. Let’s go through it, shall we? I’ll try not to be too bitter! 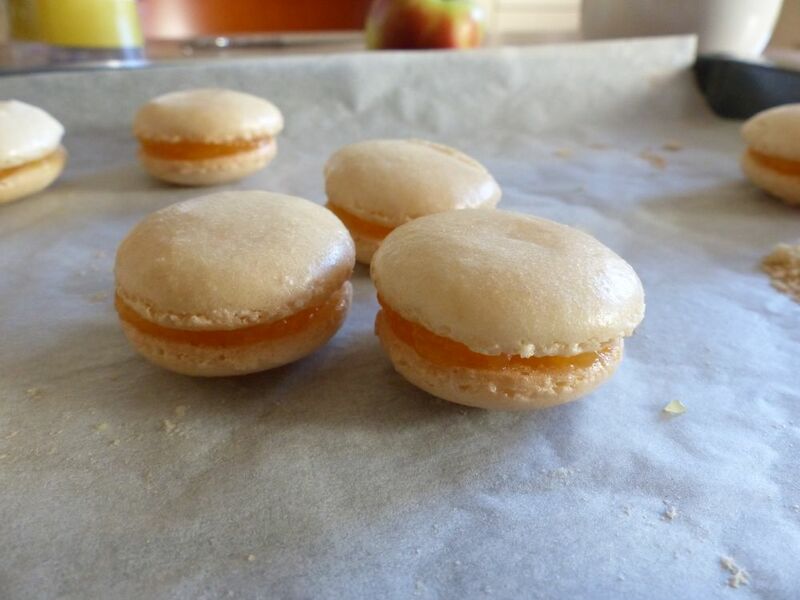 Those of you who follow me on Twitter may have noticed that I attempted to make French macarons again this weekend. I did so once before, in June last year, but although I did get a couple of cookies out of it (and they had the little feet!) I wasn’t completely satisfied back then. They were too lumpy. So, I declared I would try to make them again soon. …And here we are, in September 2015, with my second attempt. Well, my second and my third attempt, actually. This week, I set myself the challenge of trying to make the ultimate cookie (although calling it “cookie” seems wrong): the French macaron! I’d never made these before, and I spent quite a few days researching the process and watching many Youtube videos to ensure they would come out at least somewhat decent. All of the macaron gurus I watched said that your first try most likely won’t be completely succesful, but I decided to ignore that and just try the best I can! 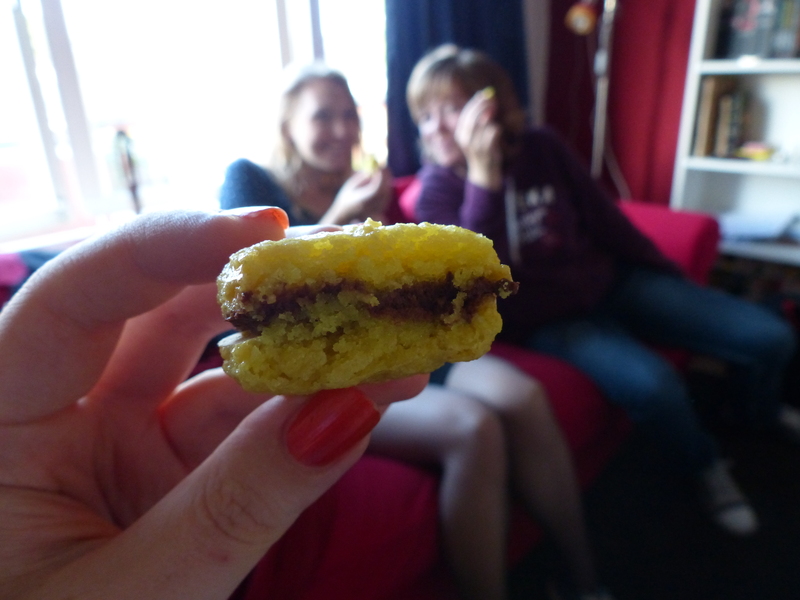 In the end, I had seven succesful macarons, which tasted pretty decent! They’re still looking quite lumpy and not entirely the way a macaron should look, but I’m pretty content for a first try. I also think I can pinpoint where things went wrong, so hopefully I’ll be able to improve on this version the next time I make these — which probably will be quite soon, since I’m set on making the perfect macaron! Of course, I didn’t make my own recipe for this, as that would have gone horribly wrong. Macarons are very finicky and everything has to be just right for them to turn out the way they should. 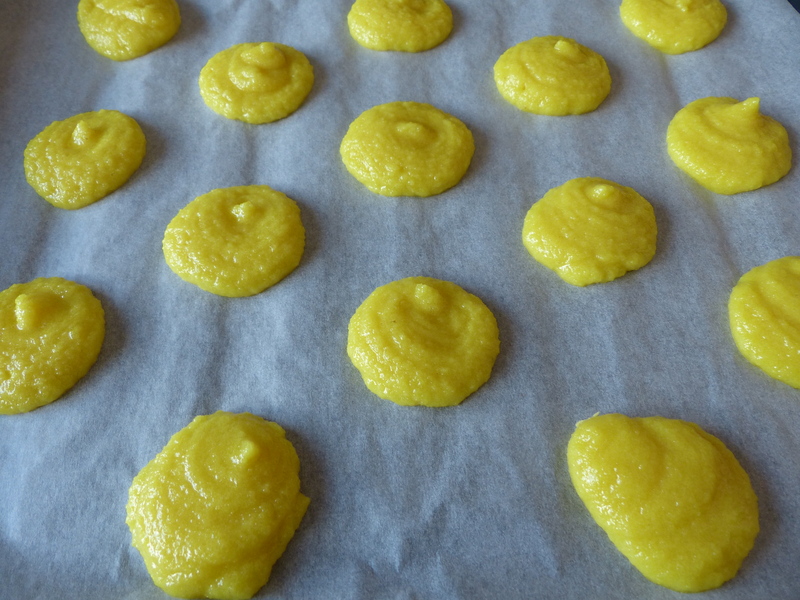 I found a wonderful step-by-step recipe for making macarons at FoodNouveau.com, and they also provided a troubleshooting guide for when things are going awry. Seriously, that guide answers every question you might have about macarons. For the rest of the recipe I would really recommend FoodNouveau! I am still going to give you my experience with making these little ones, though! I spent the entire afternoon in the kitchen yesterday, and made a few pictures along the way as well. 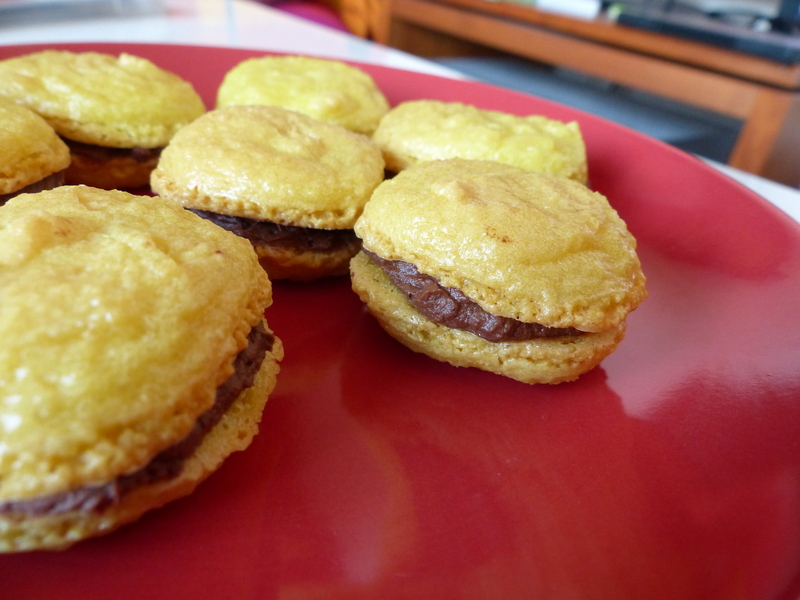 Since my oven is quite small, I had to bake my macarons in two batches, which was a good thing in the end since the first batch failed miserably. They were undercooked, and by the time I realised that it was too late to put them back in the oven. 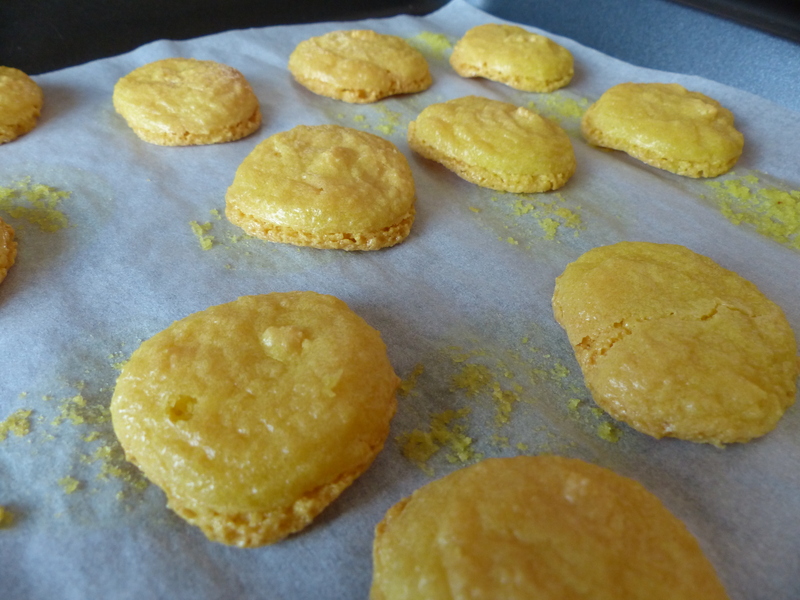 The macarons wouldn’t come off the parchment paper — at least, not in one piece. Therefore, these ended up in the bin, unfortunately. So, I knew what I had to do for the second batch: simply bake them longer and not take them out until they felt firm when touching them. At this point, I was also a little more sure about how to place the macaron batter in nice round circles on the baking sheet. Some of them are still a bit, well, not round, but most of them are looking pretty good at this point! 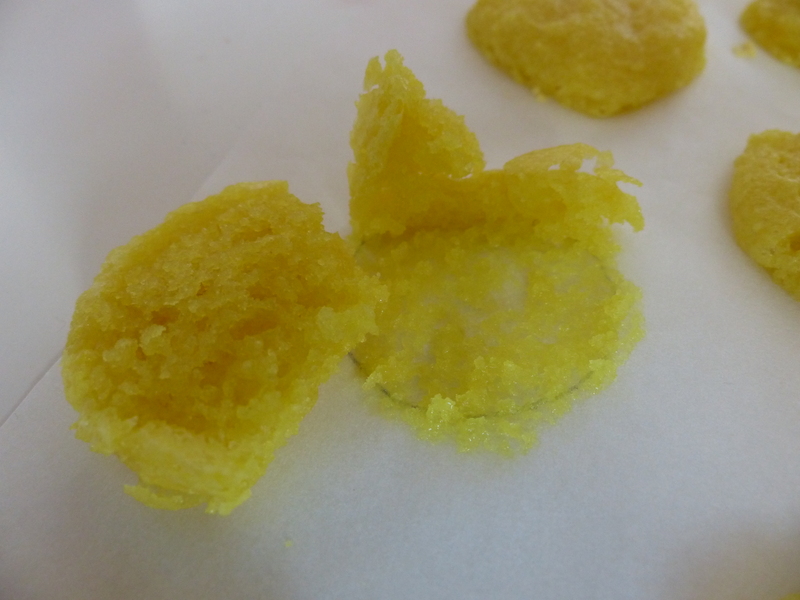 I was quite chuffed with myself, to be completely honest, and had high hopes for this second batch. I put them in the oven and noticed to my excitement that they were starting to form the little feet (or ridges) at the bottom of the macaron. That’s when you know it’s going well! However, they had a bit of trouble with getting cooked completely, as they stayed a bit squishy and soft even after about 20 minutes. In the end, I decided I had to take them out as they were starting to turn a bit golden brown as well — which is not what you want. They lost some of their bright yellow colour but I didn’t mind since that was an accident in itself as well — I put in little bit too much food colouring. Still though, I think they turned out pretty nice, and I’m still really happy with those little feet. For the filling of the macarons I made some chocolate ganache. 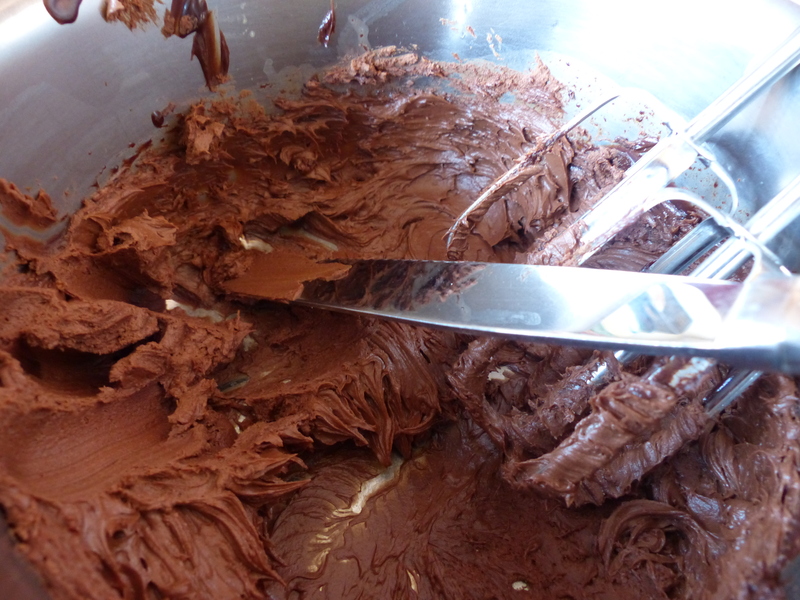 I used 100 g dark chocolate and 125 g whipped cream, which I then melted au bain marie style, and mixed together with an electric mixer. I had way too much ganache for the 7 macarons I ended up with in the end, so I still have to figure out what I’m going to do with the rest of this stuff, but that’ll be alright. Well, that is basically my macaron story. Hopefully, in the future, I can provide you with a more helpful guide on these cookies, but this is my experience with it so far! 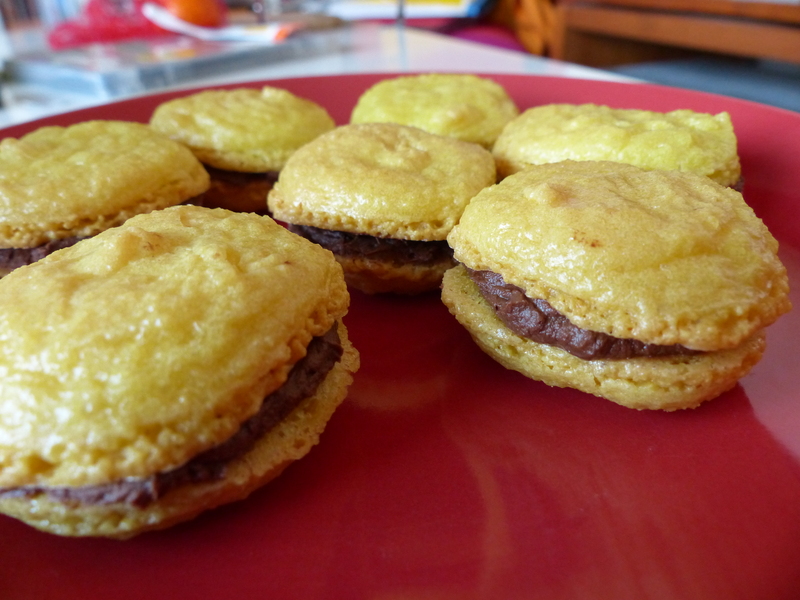 They tasted pretty good, and turned out quite well, aside from the conventional aesthetic aspect. My friends enjoyed these lovelies very much, so there you go — that’s the most important part in the end, I think! Have you ever managed to make the perfect macaron? Sundays in Bed With is hosted by Midnight Book Girl. I haven’t been feeling very well for the last couple of days, so I decided to alter my plans of trying to make macarons today. Probably not the best thing to do for the first time when your muscles are aching! I am planning on getting all of the ingredients and giving it a try tomorrow, though. Apparently, your first batch of macarons are supposed to be a failure, but I sure hope not because, man, is almond meal expensive! Anyway, onto the book I’m reading today! Those of you who follow me on Instagram might have seen a picture of it a couple of times already. 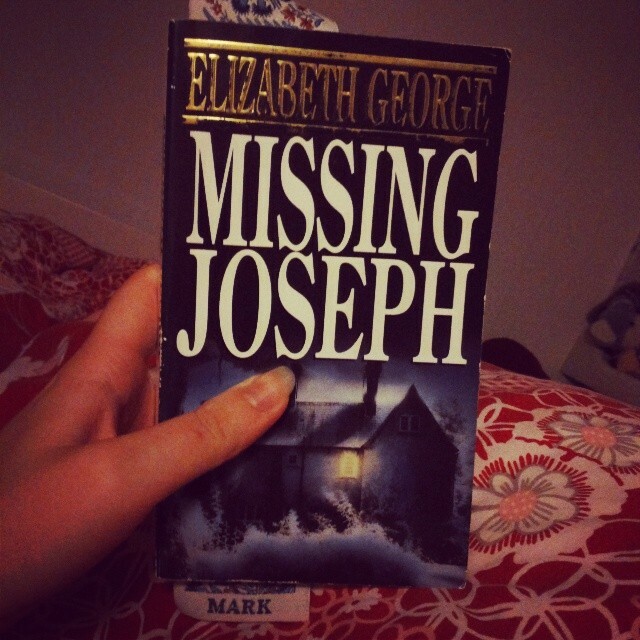 It’s Missing Joseph by Elizabeth George. Missing Joseph is the sixth novel in the Inspectory Lynley series, and I’m really enjoying it so far. It started out a bit slow, but that seems to be a feature of all of them. I’m about halfway through now and really intrigued with the little town in which the story takes place. What I love about these stories is that every single one of the characters has their own problems and secrets, and you really get to know all of them throughout the book. Also, I have absolutely no clue whatsoever who has killed the vicar (the murder around which the whole story revolves), which makes it even more intriguing. I’m also reading another book at the same time, which is the Dutch translation of The Crane Wife by Patrick Ness. In Dutch it’s called De Kraanvogelvrouw and I’m reading it for a Dutch literary website (Tzum) for which I review translated novels. This novel isn’t out in stores yet in the Netherlands and I actually received a manuscript instead of a bound book, which I thought was kind of cool (but also a bit of a pain to hold while reading). The story is based on a Japanese folktale and I’m really enjoying it so far! What are you reading on this (cloudy) Sunday?